Thu., April 13, 2017, 2:17 p.m.
OAKLAND, Calif. – Steve Kerr paid close attention. Teammates, too. Nobody wanted to miss this impromptu, incredible shooting display by two of the world’s best. Steph edged KD by a single 3, per player development coach Bruce Fraser’s figures from Tuesday’s shootout. Durant later confirmed the final stats. “That was a really skillful workout right there, there wasn’t a lot of athleticism being shown, but iron sharpens iron,” Durant said. “You only get better when you play with the best and you work with the best. Even those who see Curry and Durant every day appreciated this performance. And their post-practice shooting went up a notch this week with the playoffs about to begin. The fierce competition on Curry’s regular practice court became all-out entertainment with Durant healthy at last from a left knee injury that sidelined him for 19 games. The session lasted about 30 minutes. They talked and laughed, they cursed a little, they hollered at the basketball to cooperate. Swish after swish, an occasional clank off the rim , but that’s pretty rare for these two. Even when they are making about 100 of them each in a game that’s just for fun. “Don’t step out of bounds, KD!” Kerr yelled from behind the baseline as Durant let fly a corner 3. 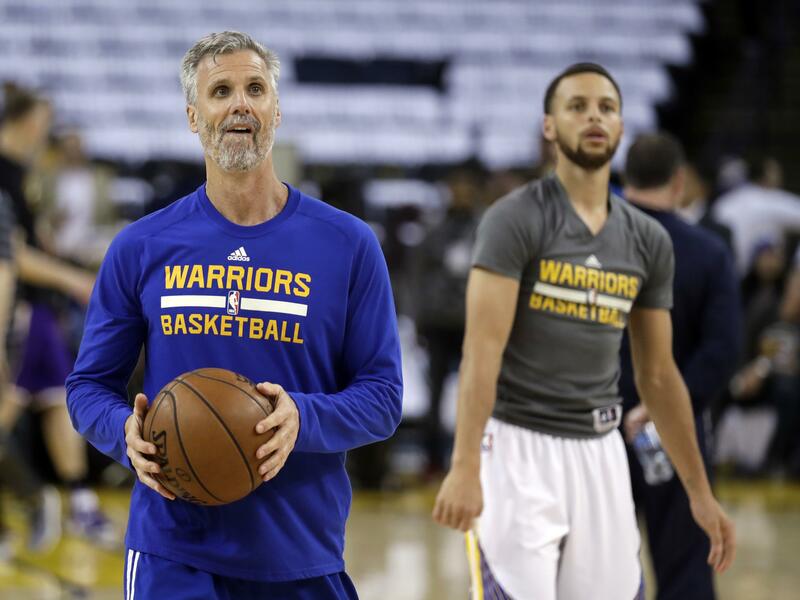 Kerr notes that his pet peeve is seeing players in practice step on the end line – and Durant has big feet so it could easily happen – because then it’s more likely to occur during games. His two biggest stars were locked in. The contest required each to make five 3s from five different spots, but when neither would miss it often took 10, 11 or 12 straight 3-pointers before someone would win that location and they could move on to the next. And you should see that frayed net. Equipment chief Eric Housen acknowledges it’s overdue for a replacement given all the work Curry gives that basket. The shooting marathon sure seems to have paid off: Durant went 11 for 16 and made 5 of 7 3s a day later in a win Wednesday against the Lakers. Curry also hit five. Now they’ll try to transfer that steady shooting and energy to the court when the NBA-best and top-seeded Warriors (67-15) host Portland in Game 1 on Sunday afternoon at Oracle Arena. Playing off ESPN’s “30 for 30” series, they’re calling this friendly game “30 for 35” – for Curry’s No. 30 jersey and KD’s 35. Published: April 13, 2017, 2:17 p.m.